Learn About Simone Martini in Art History, View His Art and Famous Paintings. Simone Martini,1283-1344, one of Italy’s famous artists in art history, was a student of Duccio. In 1315 he was commissioned to paint one of his famous paintings, "Maesta". It is similar to Duccio's Maesta, painted in 1308-11. The figures are stacked, unemotional, and do not interact. What is very different in the Maesta is the artistic point of view. The viewer is standing farther away from the throne and able to comprehend the entire scene with ease. Simone Martini also did something very different and unique in this artwork. He used a structure or canopy in which to place his figures so that they appear to occupy space. Although there are still problems relating to dimensional space martini did not understand, the “Maesta” gives us an indication of his interest and a direction he intended for his future artwork. 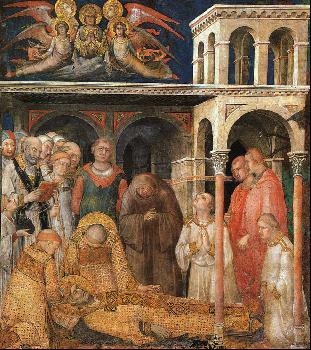 Martini showed his artistic narrative ability in interior scenes related to St. Martin in the lower church of S. Francesco, Assisi. In these colorful paintings of 1328, he was beginning to solve the problems of space and spatial relationships. His figures began to exist more realistically in space. The figures are well grounded, and have believable weight, which Duccio's figures did not. Simone Martini's figures are now rendered with more emotion; they interact with each other adding to the atmosphere and drama of the story. Martini’s color, his luxurious content and the linear quality in these paintings almost override the religious content of the art. In one of Martini's famous paintings in art history "Way to Calvary", 1340-1344 he paints surface patterns and colors much richer than Duccio's art. Although he is beginning to master spatial relationships inside architecture settings, he has not yet mastered figure relationships to architecture in a landscape setting. Simone Martini's figures have dramatically changed in this painting. They are very emotional, pushing and pulling to the point of almost being violent. Martini seems to have a new interest in his art, that of drama and the immediacy of the moment. Other famous artists of the Gothic art period are Giotto and Masaccio.